**2014 Update: I have made subsequent visits to The Ned Ludd and Hand and Heart to sample their Nottingham Sunday lunch offering. Being a country boy at heart there can be a number of things you feel aren’t as good in the city. For some time whilst at university in Nottingham I had a couple of poor examples and people raving about Toby Carvery did nothing to change my mind. In recent times I’ve gathered a better knowledge of the places to go and there are plenty of good ones out there. A roast can be precise but a large part of the joy of a Sunday lunchtime is the nostalgia of the creations of parents or grandparents. Unless you’re part of the Ramsay or Blumenthal family then I doubt you will relate to the experience at either. Hart’s is a high-end staple of the Nottingham dining scene. Three courses for £23 at lunch feeling a relative bargain when you consider £22.50 is the cost of the sirloin of beef on their evening a la carte. My starter was the best of any of the roast write-ups. 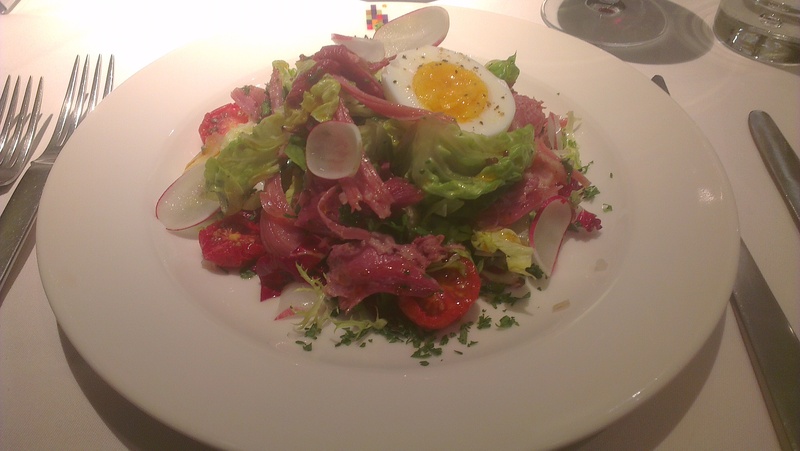 A play on the ubiquitous ham hock terrine, the ham was served as part of a vibrant salad with boiled egg adding some richness. Beef is cooked exactly as you request but the whole plate intricate and meat lacking a little flavour, a rib cut with fat would have been a better choice. The turned vegetables were nice and exact in their cooking but a rough and ready, crispy roast potato would have triumphed. Larwood and Voce have been runners up in the Observer Food Monthly awards for 5 years in a row. An achievement of consistency if nothing else, and such praise led me to it’s doors in January. I have been to L&V before for a drink before, and after, watching or playing cricket. It’s a pub, a nice, posh pub, but a pub nonetheless. The tables are a little packed in and we were occasionally buffered by the staff who were whizzing around serving and turning tables. The menu was strong with more options than expected. Between our party a number of starters were ordered including my chicken liver pâté, rich and luxurious with a good complimentary chutney. 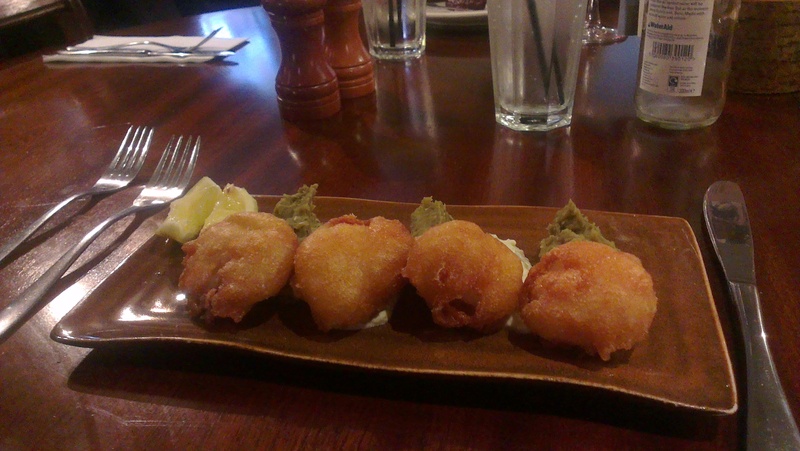 Beer battered scallops were a popular choice, four crispy golden seafood nuggets complimented by the traditional fish and chip accompaniment of mushy peas and tartare sauce. The decisions to be made on the main course were difficult, I plumped for a few slices of cow. 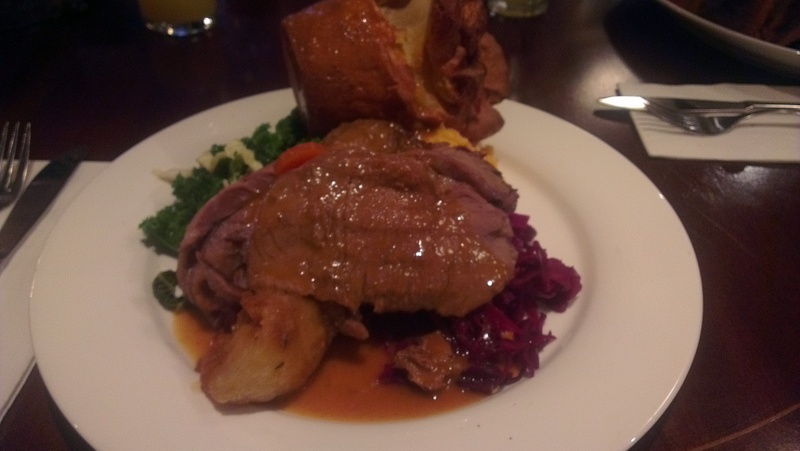 A more popular choice for our table was ‘A Proper Roast’ including beef, lamb and pork. The most striking element of our plates on their arrival was the significant Yorkshire pudding, which was successful in being light and not dough-y. 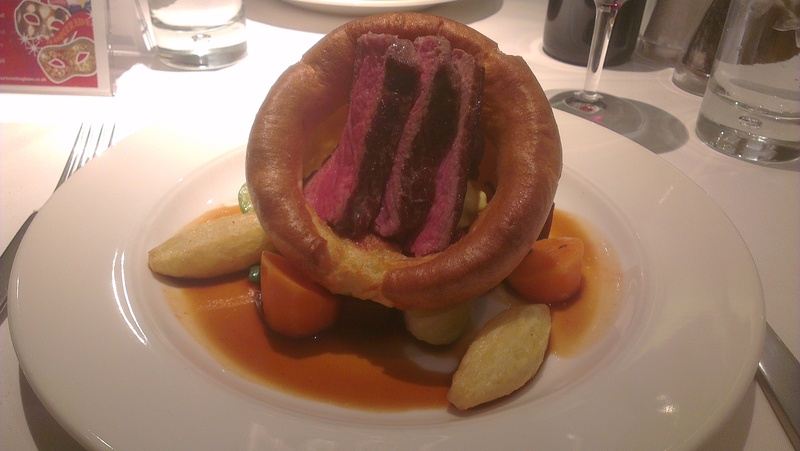 The beef was nice, a good tender cut although could have been pinker to my taste. A standout as well as the Yorkshire were the potatoes, golden and crispy, exactly to my taste. Other veg was ok but didn’t stand out from a crowd. Gravy was…interesting. It’s main constituent appeared to be carrot as it had a distinctly orange hue. This gave it a nice sweet tang but a rich beefy liquor would have been preferable, they did though happily provide extra gravy which some places do begrudgingly. Despite dessert being thoroughly unnecessary I enjoyed a chocolate mousse although didn’t quite deliver the salty depth the caramel sauce should have. A Sunday afternoon classic the crumble was well handled, some thick no-nonsense custard pleasing. Both venues have a little cheaper price point with the main article setting you back £9.95, 2 courses for £12.95, 3 for £14.95. 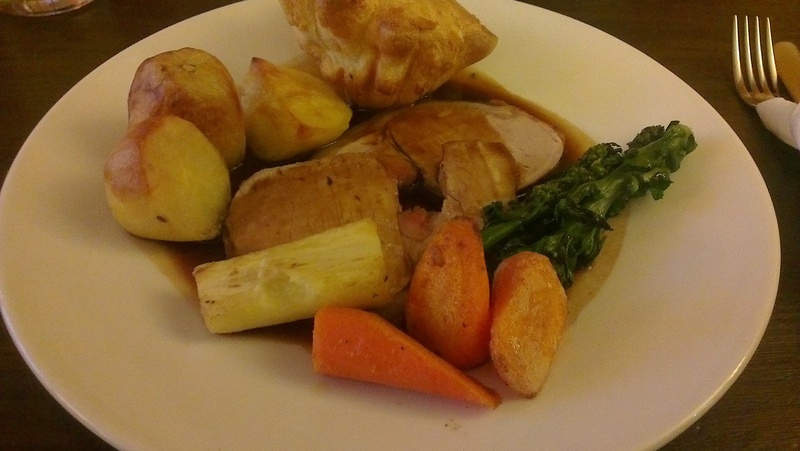 Both were strong, hearty affairs with not much to choose between the roasts. The difference was in the other courses, a smoked duck starter at Cook and Hoop was much more polished than a bland soup with some doorstop bread wedges at The Cross Keys.